Hard to find treasures have just arrived and are in our "Rare-Estate" section. 'KELLY WEARSTLER' 'STRADA' GOLD PENDANT CHANDELIER20'light. Measures: 28"W. Retails for $1675. JNB002. 031419.$850.Email us about this piece. MID CENTURY MODERN 'UFO' LAMPBlack lacquer finish and silver base. Measures: 13"Dia x 22"H. PAM004. 030819.$110.Email us about this piece. BISQUE COLOR PORCELAIN LAMPSPair has raised porcelain flowers and custom shades. Measure: 32"H> HTT116A/B. 030619.$695. pairEmail us about this piece. 'ROBERT KUO FOR MC GUIRE' PAIR OF LAMPS IN BAMBOO MOTIFBlack with gold accents. No shades. Measures: 31"H. HTT120. 030619.$650. pr.Email us about this piece. 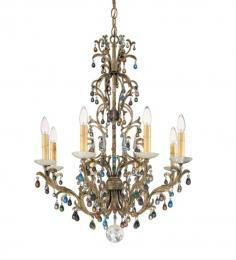 CHANDELIER WITH AGED BRONZE METAL FINISHTen arms with five candles and crystals. Measures: 19"Dia x 31"H. BR039. 111418.$1200.Email us about this piece. LAMP WITH FOUR PRONGED LIGHT BRONZE BASEWhite shade. Measures: 26"H x 13"Dia. DAG026. 029919.$50.Email us about this piece. 'CURREY AND CO.' 'GRAND LOTUS' FLUSH MOUNT LIGHT FIXTUREMeasures: 18.5"Dia x 5"H. MN002. 013019.$600Email us about this piece. 'MARBRO' HANDPAINTED SONGBIRD LAMPSPorcelain lamps with silk shades and dust covers. Measure: 16"W x 36"H. With line switches. BAG022A/B. 121218.$1695. pairEmail us about this piece. DESK LAMP ADJUSTABLE IN PEWTER COLOR METALWith hexagonal metal shade. Measures: 28"W x 24"H. AC007. 121618.$410.Email us about this piece. 'POTTERY BARN' ADJUSTABLE DESK LAMPIn pewter color metal with conical shade in metal. Measues: 23"W x 25"H. Some wear on cord, as found. AC006. 120618.$310.Email us about this piece. 'VERITABLE' CONTEMPORARY TABLE LAMPGourd shape, cream colored base with chocolate brown matte round shade. Measures: 16"Dia x 27.5"H. BR040. 111418.$410.Email us about this piece. "BAKER" MURANO-GLASS BAUBLE SCONCESGold glass and finish with beige silk shades. Measure: 7"W x 14"H. Two pair available. GAM008AB. 111518.$1000 Each Pair. Firm.Email us about this piece. WOODEN FLOOR LAMPS WITH GOLD DETAILINGPair has ivory shades and wood finials. One finial striped. *One lamp significantly faded. Measure: 63"H. CA003A/B. 111018.$310, pair as foundEmail us about this piece. BLACK 'CONTI' INDUSTRIAL STYLE PAIR LAMPSMeasure: 27"H. Minor damage. MC013A/B. 092918.$175.Email us about this piece. VINTAGE 'MARBRO' GREEN FOLIATE DESIGN LAMPCrackle glazed gold ceramic base with finial and double socket. No shade. Measures 41"H x 8.5"Dia. NF002. 100118.$920.Email us about this piece. 'NANCY CORZINE' MURANO SILVER SPHERE TABLE LAMPSPair has coordinating drum shades. Measure: 29.5"H. Retail for $4K. MM042A/B. 0080718.$1950.Email us about this piece. 'J. ROBERT SCOTT' MARTIN TWIST FLOOR LAMPWith coordinating shade, silver finish. Retails for $5616. Measures 62"H. MM006. 080818.$1650.Email us about this piece. ANTIQUE JAPANESE LAMP WITH MARKAsian motif with wood base and top. *No shade or harp or finial. Measures: 19"H. MAP006. 061918.$110.Email us about this piece. ORIENTAL DESIGN METAL BASE CONVERTED TO LARGE LAMPCream shade, double socket and line switch. Measures: 39"H. REL001. 062318.$750.Email us about this piece. 'ARCOBALENO' BLACK ENAMELED DESK LAMPBy Marco Zotta for Cil Roma. Ca 1970's. Mid century classic! Measures: 3.5"W x 16"D x 15.5"H. JA002/ 051718.$950.Email us about this piece. ORIENTAL CERAMIC LAMP WITH ORANGE, RUST AND GRAYOn wood base, jade finial and silk shade. Measures: 23"H. JZ001. 052018.$310.Email us about this piece. LAMP WITH BLUE/BEIGE GINGER JAR CERAMIC BODYOn a wooden base. Oriental motifs. White linen shade. Measures: 29"H x 19"W. KW125. 042418.$495.Email us about this piece. 'GENESIS' SCHONBEK 8 ARM CHANDELIERLovely bronze antique finish with centerpiece. Colored jeweltone rock crystals. Center ball is solid rock clear crystal. Certificate of authenticity. Measures: 30"H x 24"Dia. MIP001. 041718.$1,495.Email us about this piece. 'RESTORATION HARDWARE' PAIR ADJUSTABLE LAMPSWith swing arms, dark bronze finish and ecru linen shade. Measure: 32"H. SHR005A/B. 032818.$495. pairEmail us about this piece. ITALIAN REGENCY STYLE LARGE CHANDELIERIron with crystal. Measures: 36"H x 31"W. GF009. 071817.$3100.Email us about this piece. CONTEMPRARY CHANDELIER PURCHASED AT 'VERTIBLES'Six arms, metal frame in silver/gold washed finish, amber tear drop crystals. Approximately 34"H x 24"Dia. LZA001. 022018.$950.Email us about this piece. PAPER SHADED ORIENTAL LAMPFrom Honeychurch Antiques. Shade slides around to reveal inside bulb area. Measures: 26"H x 13.25"W. DH003. 102817.$510Email us about this piece. TABLE LAMP HAND PAINTED PORCELAINHas metal base. Measures: 18"W x 26"H. JR013. 101417.$410.Email us about this piece. 'WILDWOOD' BRASS LAMPCream silk shade on black plinth. 28.5"H. KW111. 080217.$395.Email us about this piece. 'MILO' CONTEMPORARY FLOOR LAMPChrome and metal base, cream vinyl shade. 18'Dia x 66"H. MC004. 071217.$250.Email us about this piece. GINGER JAR LAMP WITH WOOD PLINTHPleated cream silk shade. 3l"H. KW114. 080217.$295.Email us about this piece. BLACK LACQUER LAMPWith Mother-of-Pearl motif, Lucite base and linen drum shade. From Michael Folks Showroom, Seattle Design Center. 31"H. MF087. 061317.$895.Email us about this piece. AUTUMN STRIPES FLASK LAMPWith gold base and gold trimmed white drum shade. 3l"H. From Michael Folks Showroom, Seattle Design Center. MF084. 061317.$550.Email us about this piece. LAVENDER MIRABELLA LAMPWith a silver base and white drum shade with silver bands. 33"H. From Michael Folks Showroom, Seattle Design Center. MF086. 061317.$510Email us about this piece. NAVY OCTAGONAL LAMPOn a gold wood base with a white drum shade. 29"H. From Michael Folks Showroom, Seattle Design Center. MF086. 061317.$510Email us about this piece. SILVER SWIRL LAMPFrom Michael Folks showroom. Round shade. (MF024082715)$450.00Email us about this piece. © Copyright 2007-2019 Bell’Occhio Home. All rights reserved. Site by Cartwheel Creative.